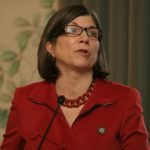 Anna Marie Quindlen is an American author, journalist, and opinion columnist. Her New York Times column, Public and Private, won the Pulitzer Prize for Commentary in 1992. She began her journalism career in 1974 as a reporter for the New York Post. Between 1977 and 1994 she held several posts at The New York Times. Her semi-autobiographical novel One True Thing (1994) was made into a film in 1998, starring Meryl Streep and Renee Zellweger. "In the family sandwich, the older people and the younger ones can recognize one another as the bread. Those in the middle are, for a time, the meat." "People always blame the girl; she should have said no. A monosyllable, but conventional wisdom has always been that boys can’t manage it." "Children should have enough freedom to be themselves – once they’ve learned the rules." "But it’s important, while we are supporting lessons in respecting others, to remember that many of our youngest kids need to learn to respect themselves. You learn your worth from the way you are treated." "I’m sure not afraid of success and I’ve learned not to be afraid of failure. The only thing I’m afraid of now is of being someone I don’t like much." "After all those years as a woman hearing ‘not thin enough, not pretty enough, not smart enough, not this enough, not that enough,’ almost overnight I woke up one morning and thought, ‘I’m enough.’"
"Women who marry early are often overly enamored of the kind of man who looks great in wedding pictures and passes the maid of honor his telephone number."